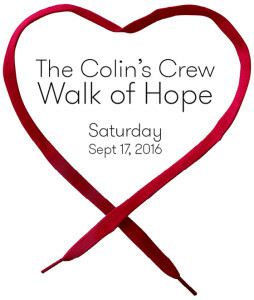 Register today for the Colin’s Crew Walk of Hope Fundraiser on Saturday, September 17th. This event has been organized to raise donations in order to assist with our ongoing mission to fund the Meals4Kids, Snacks4Kids and Fun4Kids programs, which support families affected by childhood cancer. Colin’s Crew is looking for walkers to join us on this trek or to help donate to a great cause to help amazing kids. Walk Begins – 10:00 a.m.